My pool party was so cool with these LED Glow lights!! I wanted to have an epic pool party, and I knew I needed something special to make it over the top. These LED glow lights really gave our guests something to smile about. They were a lot of fun to dance with and gave a great glow throughout the night. Awesome party product! We bought 5 regular cases of this for a special event at our nightclub for a total of 360 sticks and we were still short! Everyone who got em loved em! We will be getting these again for all the future special events at our venue. Thanks for the great service and super fast shipping! Perfect for rave dance party! We had these at a techno rave dance at my daughter's birthday party. These were really cool and everyone wanted to dance with them. They change colors when you shake them! These are the same led foam sticks I got at Ultra Music Festival when I was down in Miami in March. After watching the video on this page, i'm so glad I found you because I was looking everywhere for these! I used these for my wedding last week and all 250 guests loved them! Thanks so much for customizing them with my name and my husbands name along with the date of our big day! Now all our wedding guests will remember where they got this neat little gift! 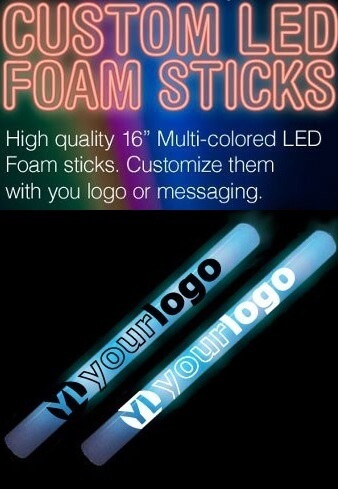 Nightlife Supplier’s LED foam glow sticks are great for your nightclub, wedding, or any special event. For our most sought after and popular glow sticks (view the pictures above). Our custom LED foam glow sticks can be designed to your exact standards for your special day! Our 16" 6-mode multi-color foam sticks are our most popular type (refer to video) but we also provide 3-mode single color sticks if you need just white or just green or just blue lights. All Custom Orders MUST be placed via phone or email. If you try to place a custom order online, you will get an error message saying that we do not ship to your location. 144 Sticks Minimum for CUSTOMIZED ORDERS (please see details below). - 144 Sticks (Minimum Order for Customization/Branding) with an additional cost.